You’ve heard how CBD dog treats could benefit your dog. Maybe you want to give it to them to reduce seizures, anxiety, arthritis, inflammation, pain or one of the many other health issues CBD can help with. You have decided to go with dog treats instead of oil, but you are having difficulty finding them or your dog doesn’t like the taste of the ones you’ve bought. 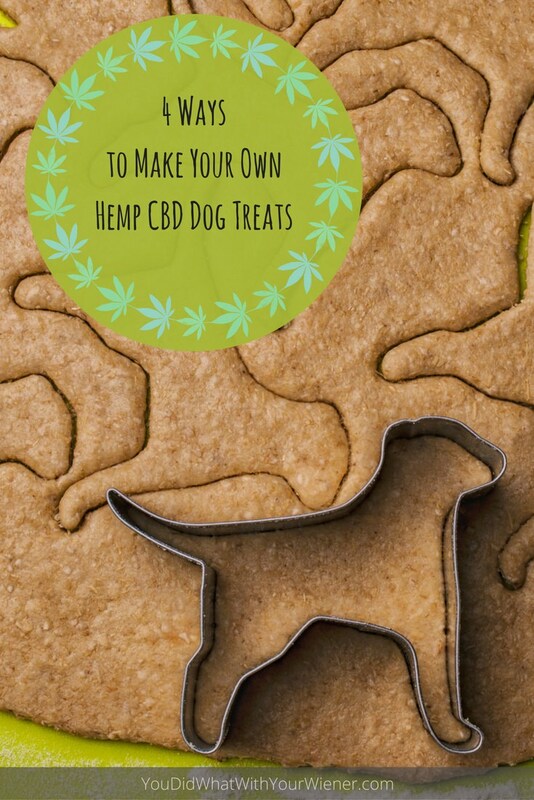 Have you thought about making your own CBD dog treats? It’s easy if you purchase some CBD oil for pets. Important Note: It’s the safest to by pre-made CBD dog treats from a company. Good ones have put a lot of work and testing into making sure exactly how much CBD each treat contains. While most dogs won’t have an issue with more CBD than recommended on the package (some actually need it to be effective), or less (although it might be less effective), go with the pre-made treats if you want to be well on the safe side. If you think you know what you’re doing after reading this, or are pretty comfortable with the risk, then go ahead and give making your own a try. Also Note: About the legality and safety of CBD: To be clear, the only CBD product you should ever give your dog is one derived from industrial hemp. Industrial hemp has little to no THC and CBD products produced from industrial hemp are legal in any state. However, depending on the crop, an oil CAN still contain trace amounts of THC. It’s important to purchase a product made specifically to give to dogs and verify it has been tested by an independent lab to contain no THC. It is also very important to consult with your vet before giving your dog a new supplement (although, be warned – less-than-progressive vets may disregard CBD as a viable treatment in general). Where Can I Get Legal and Safe CBD Oil for My Dog? There are many ways to find CBD oil for your dog. If you live in a state where marijuana is legal – like Washington or Colorado – you may be able to find it at your local specialty pet food store. For example, in Seattle, I can buy CBD products at All the Best Pet Care. You may also find it sold alongside human products at local marijuana dispensaries. If you don’t live in a cannabis-friendly state, you may have to order it online. My favorite, reliable online source of CBD oil and treats is HempMy Pet. How much CBD a particular dog needs will vary. It varies based on weight and the condition being treated. For example, a small dog probably won’t need as much as a big dog and you may need to give them more to treat anxiety or to help control seizures than you would for general wellness. The bottom line is you have to find what works for your dog and situation. For the homemade treats, I suggest giving your dog the CBD oil directly first to determine how much they need in each dose. Start with the lowest recommended amount and work your way up from there. Once the desired result in achieved, you will know how many drops of oil, or how many mg of CBD, to put in each treat. The good news is, several studies on CBD have shown it has little to no side effects, even in high doses so you are very unlikely to harm your dog if you accidentally put too much in a treat. In cases where side effects from too much did occur, the most common one was drowziness. On very rare occasions, side effects have included excessive itchiness or mild vomiting. If your dog starts having any of these symptoms after ingesting CBD, stop giving it to them and they should return to normal. If you are concerned, be sure to take your dog to the vet. 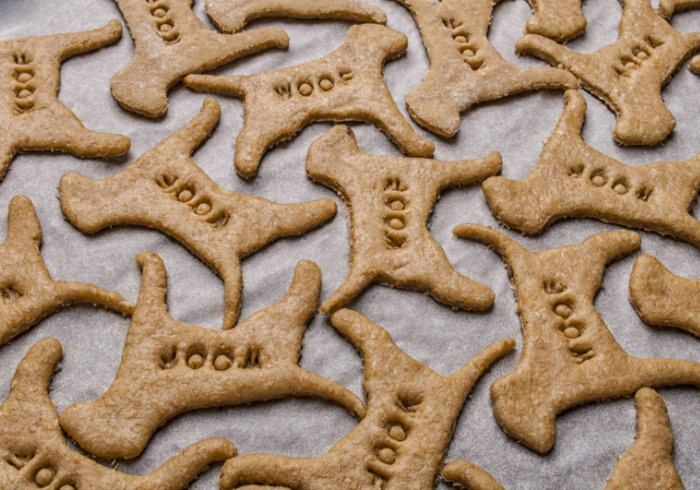 There are four ways to make your own CBD dog treats at home. The first two are easy, the third one takes a bit more effort and care, but the last one – baking your own CBD dog treats – can be tricky. It’s tricky because too much heat can cause the CBDs in the oil evaporate so there is little or no beneficial ingredients in the treat. It’s best to stay away from making baked CBD dog treats unless you are experienced cooking with marijuana. Let’s look at the ways that don’t involve heat so you don’t have to worry about evaporation. One super simple way to make your own CBD dog treats is to put drops of the oil on your dog’s treats. I’ve done this and I can tell you it doesn’t necessarily work on any ol’ treat. The trick is to get the oil to soak in. In order for this to happen, you need to pick “porous” dog treats. Dog treats that look granular or that have little holes in them work best. One of my favorite treats for this is BIXBI BarkPops (they’re like dog Cheetos). Just place the number of drops of CBD oil your dog needs on the treat, let it soak in for a minute and let your dog enjoy. That’s it! This is also a simple way to make CBD dog treats and they are especially great in the summer if your pup needs to cool off. However, you may need to do a little math. 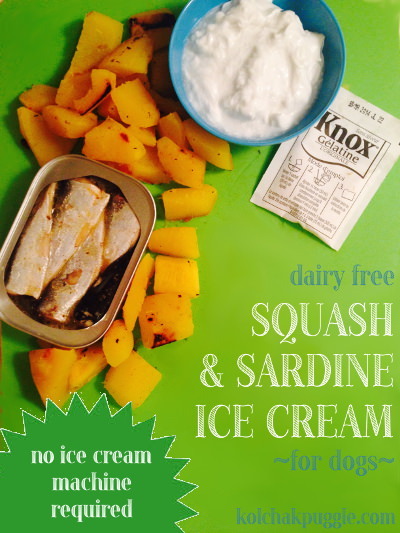 Most frozen dog treats are prepared in batches. That means you will have to multiply the number of treats the recipe will make by the number of CBD oil drops your pet needs and add that to the recipe. Adding CBD oil to frozen treats works best if you first add the oil to the “thicker” ingredients (like peanut butter, yogurt, etc) and then add in the liquid. If you mix it in well, and each treat is approximately the same size, you should get an even dosage of CBD per treat. Alternately, you can make a frozen treat mix, place individual portions in an ice cube tray, add the appropriate amount of oil to each “cube” and then mix it in. Do remember that adding the oil will change the freezing temperature of the mix so you might need to leave them in longer and/or the finished product may be kind of soft-frozen. If you don’t want to use your own ice cube trays to make these treats, and you want to make them cute for your dog, check out this silicone paw print ice cube tray. Your next option if you don’t want to put CBD oil on a pre-made treat, or give your pup a cold, frozen treat is to make no-bake dog treats. You’ll want to pick a treat recipe that calls for some kind of oil so you can replace all or part of that with CBD oil. No-bake dog treats are softer than baked dog treats so, while these are a great option around home, they can crumble if you are travelling or hiking. To help prevent this, try putting them in a hard-sided container to protect them. Like I said, this is where it gets tricky. Making baked CBD treats for your dog is definitely for people with prior experience making marijuana edibles for people or those willing to take a bit of a chance. The lower the temperature you bake the treats at, the less chance any of the CBD will evaporate. Generally CBD is completely degraded at temperatures in excess of 392 degrees F, although it starts to break down long before that. The consensus online seems to be the baking temperature should be 350 degrees or below. You can either choose recipes that don’t require baking at a higher temperature or lower the recommended baking temperature for most recipes and just extend the duration accordingly. This method is also tricky because it’s hard to make sure each treat has the correct dose of CBD. Using logic, it seems pretty safe to make a dog treat recipe, decide beforehand how many treats the batch will make, add the appropriate amount of CBD oil for that number of treats, and make sure you mix the oil in well to get the right dose in each treat. However, that is no “scientific” guarantee. There is some risk involved that each treat will not contain the amount of CBD you intended. (remember, giving a little too much CBD is likely not harmful but you could end up with treats that don’t have a full dose in them so aren’t as effective). Also note you don’t want to make the treat recipe and THEN add the CBD oil or the mix will contain too much oil/moisture and is unlikely to turn out as planned. In general, the amount of oil a recipe calls for can be replaced with an equal volume of CBD oil. Therefore, it’s best to choose a recipe that already lists some kind of oil in the ingredients list. What’s the Easiest Way to Make Your Own CBD Dog Treats? Besides the effort it takes to make the treats, there are other considerations like the ease of making sure the final treat contains the proper dose of CBD, testing to make sure the final product has the right consistency and making sure you don’t lose any of the CBD in the process. So now you have some alternatives to buying pre-made CBD dog treats. Experiment, have fun, and good luck! How to sensibly buy LEGAL and best quality cbd products for my dog? I’ve heard how CBD dog treats could benefit your dog; reduce seizures, anxiety, pain etc. Hey Jessica, this is a great idea and overview. I have been sharing our story with CBD and the benefits we have noticed in our dogs, but a lot of questions I get from friends is regarding dosage and intake methods. I believe CBD oil is the best way for absorption, however many people have stated that it’s not so easy to get their pup to comply. So I never really thought about making your own treats in the methods you describe here. I’ve recommended just buying pre-made treats, but this is certainly a great option, especially if people buy oil and administering it is not going so well. Thanks! It sure got my attention when you said that one of the advantages of using hemp for dogs was the idea that it carries no side effects whatsoever even when they were given in high dosages. I have been thinking of giving this kind of treatment for my pet because he has been so lethargic and anxious lately, but I am not that confident. Seeing this article made me realize that its safe. Now all I need is to ask the vet if I chose the right decision. Thank you! We’re out of CBD for Ravasz now but now I’m looking to find a new bottle, it’s great to get some more inspiration. Thanks! I am using CBD in my dogs’ treat for a long time. They are really great and useful for my pets. I think every dog owners should use CBD for their pets. 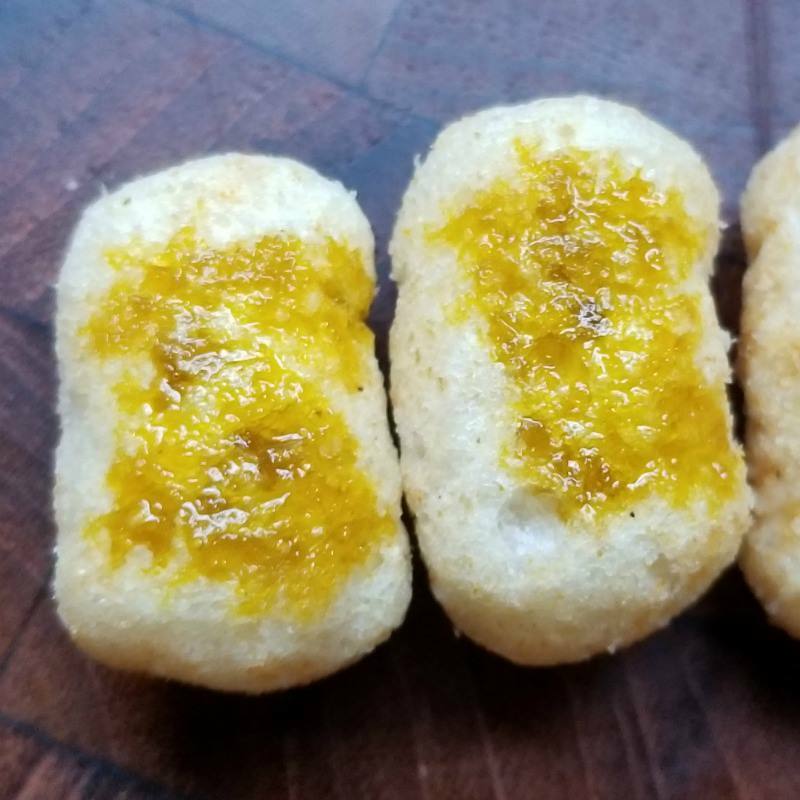 Hey do you make your own treats with CBD oil ? If so can you please help me , with a good recipe please please ! I really believe this is a wonder supplement for the dogs . Personally I have used it for a senior dog that was overweight and having hip issues. She has lost the weight and she moves like she was young again. As well as a pup with skin problems went to vet several occasions and nothing but drugs with no results, starting using CBD cream directly to skin and cookies and it has been clear for almost 6 months. To buy pre-made cookies can be expensive for the amount that I use . Thank you for the recipe’s they work great and keep my cost down. I am wondering if I could just drop a few drops of CBD tincture in a pill pocket for my dog. Has anyone tried this? Do they get the full effect if its not put under their tongue? Hi Debbie. I’ve actually thought about doing this but haven’t tried it. It seems to me that it could work if you were only putting 1-3 drops in there. I appreciate what you shared about looking at ways to make CBD dog treats that don’t involve heat. I don’t trust my cooking abilities, so I think I’ll contact a company to supply me with CBD dog biscuits. I think CBD products have several medicinal purposes, so I think it’s a good idea to purchase some for any dog with any form of ailment. Do you have any experience with dehydrated CBD dog treats? The temp doesn’t go over 160 degrees but, I do it for 30 hours. I don’t personally but the lower the temperature they are “cooked” at, the more CBD will be retained.